In Jordan Spieth, Golf World Looks For Its Next Tiger — Again : The Two-Way Even Tiger Woods didn't make the cut at the Masters when he was 20, but Jordan Spieth was tied for the lead with Bubba Watson at 5 under par going into Sunday's final round. 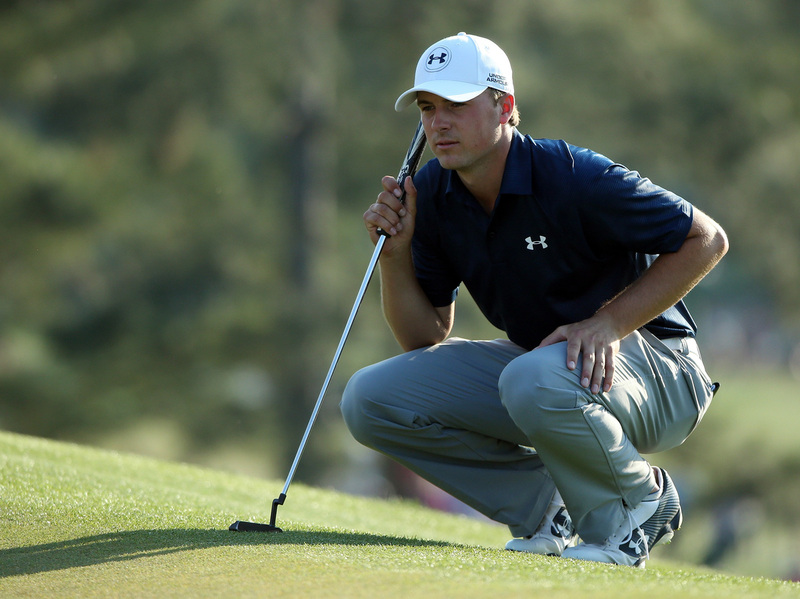 Jordan Spieth lines up a putt during the third round of the 2014 Masters on Saturday. The golf world loves discovering a player who might be the Next Big Thing, someone who could take Tiger Woods' place someday as world's best golfer. This weekend's Masters at Augusta National could be on the verge of serving up the newest candidate. Jordan Spieth, who was tied for the lead with Bubba Watson at 5 under par going into Sunday's final round, is only 20. He has already won a PGA Tour event — the John Deere Classic last summer when he was still 19. You have to go back to 1931 to find another teenager, Ralph Guldahl, who's won a pro tournament. No one that young has ever won the Masters. Golf.com says that at the University of Texas in 2011, "Spieth was the Big 12 Player of the Year and a first team All-American while leading the team in scoring average. His team went on to win the national championship." With this Masters, he has also already out-youthed Woods — who competed in the Masters at age 20 in 1996 and impressed the field with his abundant talent, but didn't make the cut that year. Woods won the next year at age 21. "He's young, nerves are no big deal to him," Watson told reporters. "He's a great player and a guy like that, he obviously has no fear. ... He's special." Born during the Clinton administration, Spieth is from a generation that hasn't even learned to fear Woods, The New York Times points out. Perhaps that's the key to discovering golf's next greatest. "It could be someone who listens to the talk of Woods's onetime dominance and rolls his eyes the way he does when his grandfather talks about Elvis," The Times' Bill Pennington writes. "Spieth, child of the 1990s, said he had not played a video game in years," says Pennington. "This week, he has turned off his phone." Of course, Sunday at the Masters is long and intense, and Spieth could wither on the green. Watson, 35, won the championship in 2012 and has the advantage of experience. "I've won one, so I've got that going for me, you know," Watson told reporters after he lost his three-shot lead on Saturday. "But if I play bad tomorrow, I still have a green jacket, so that's a positive." A number of young golfers have been eyed as the next tiger — Rory McIlroy, for one. Just as golf watchers love to hunt for the next Tiger, they also love to reject the very quest as nonsense. "Anointing Spieth as the next anything in golf is premature at best and abject folly at worst," Pennington says. Mark Herrmann of Newsday agrees. "Being the first and only Jordan Spieth is plenty," he writes. Even the teenage phenom Guldahl, who went on in his 20s to win the Masters and two consecutive U.S. Opens, gave up the tour for lack of interest, and you've likely never heard of him. One way Spieth is not like the young Woods, says the Golf Channel's Joe Posnanski, is his demeanor. Where Woods was all intensity and focus — "He was Alexander the Great, and he came to get what he believed was rightfully his" — Spieth is "quirky and funny and respectful and agreeable." "Jordan Spieth seems entirely comfortable being Jordan Spieth," Posnanski says. A previous version of this story incorrectly said that Bubba Watson won the Masters last year. He won it in 2012. The previous version also incorrectly said that Rory McIlroy did not make the cut.